MILAN – The Coffee Board of India has lowered its forecast for the 2018/19 coffee crop. The Post Monsoon Crop Estimate based on crop estimation samples data for the year 2018-19 is placed at 319,500 MT comprising of 95,000 MT of Arabica and 224,500 MT of Robusta. There is a overall decline of 60,500 MT (-15.92%) over the post blossom estimate of 2018-19 (380,000 MT). During the year, the post monsoon Arabica crop estimate showed an overall decline of 15,000 MT (-13.64%) and Robusta declined by -45,500 MT (-16.85%) over the post blossom crop estimates. However, When compared to the final crop of previous year 2017-18 (316,000 MT), the post monsoon estimate of 2018-19 has shown a marginal increase of 3,500 MT (1.11%), which is mainly contributed by increase in Robusta coffee. Among the states, major reduction in crop is reported from Karnataka. The post monsoon estimate for Karnataka is placed at 219,550 MT recording overall decline of 48,250 MT (-18.02%) over the post-blossom estimate of 2018-19. In Karnataka, the Arabica coffee production estimated at 67,950 MT which has shown a decline by 13,200 MT (-16.27%), while Robusta coffee production estimated at 151,600 MT shown a decline of 35,050 MT (-18.78%) over the post blossom estimate. Among the major coffee growing districts in Karnataka, the major loss of about 25,020 MT (Arabica 4,750 MT and Robusta 20,270 MT) is reported from Kodagu district followed by Chikkamagaluru district 17,250 MT (Arabica 6,550 MT and Robusta 10,700 MT) and Hassan district 5,980 MT (Arabica 1,900 MT and Robusta 4,080 MT). 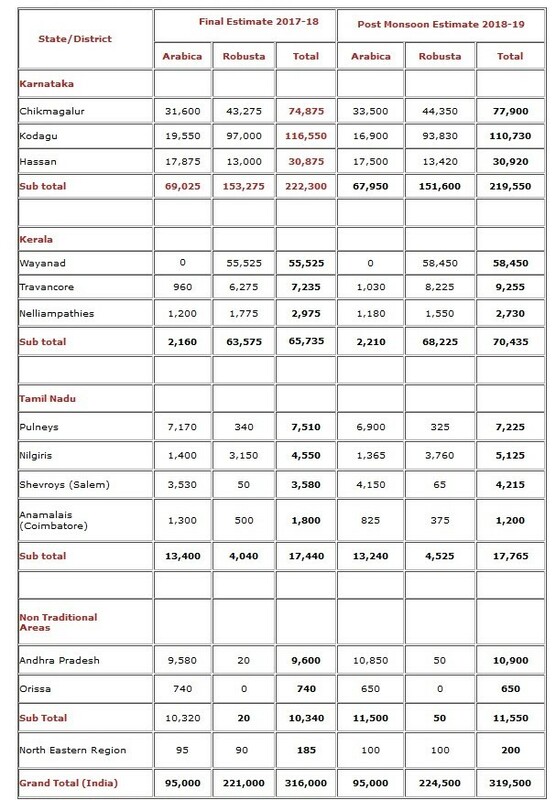 While in Kerala, which is a mainly Robusta coffee producing region, the post monsoon estimate of 2018-19 is placed at 70,435 MT with a decline of 10,215 MT (-12.67%) over the post blossom estimate (80,650 MT) of 2018-19. The major factors responsible for reduction in post monsoon production estimates of 2018-19 in Karnataka and Kerala are that though the initial crop set was good with record post blossom stage estimate of over 3,80,000 MT, but from early July, 2018 onwards, continuous heavy rainfall with severe intensity has been witnessed especially in coffee areas of Karnataka and Kerala. More importantly, severe to very severe rainfall occurred during the month of August 2018 in the coffee growing districts of Karnataka and Kerala, especially in the heavy rainfall zones, leading to substantial crop losses, flooding and landslides. It is evident that in all the major coffee growing areas of Karnataka and Kerala, there is an excess rainfall of 46% to 98% during the period Jan-Sept 2018 in comparison to the rainfall received during the corresponding period of the previous year 2017. The continuous rains led to soil saturation and wet feet conditions resulting in defoliation, berry drop and incidences of stalk rot and black rot. Uprooting of shade trees as well as landslides have also damaged the crop. This severe to very severe intensity rains which occurred during August 2018 has caused unprecedented flooding and landslides in coffee areas affecting the coffee plantations, estate infrastructure and road and communication network. In Tamil Nadu, which is mainly Arabica coffee producing region, the post monsoon production estimate of 2018-19 is placed at 17,765 MT which showed a decline of -1,535 MT (-7.95%) over the post blossom estimate (19,300 MT) of 2018-19.